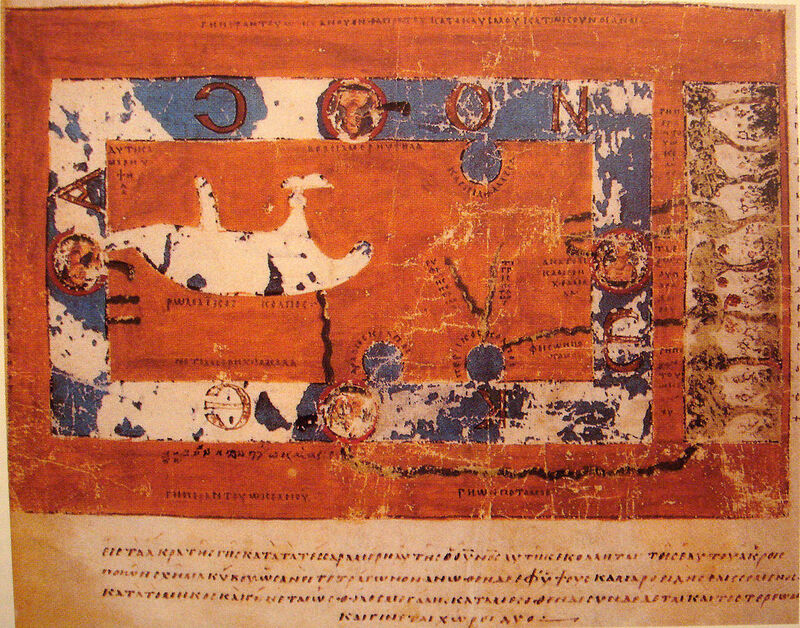 Are there any maps still surviving that were made in the Byzantine Empire? There are plenty of maps from Western Europe during this time period, but I haven't heard of any surviving from the eastern empire. The map is oriented with north to the top. It shows a rectangular landmass in the middle of the World Ocean (Okeanos), reflecting what Cosmas thought was the "floor" of the tabernacle-shaped universe. The Roman Gulf (i.e., Mediterranean) is shown in the western half, with indentations for the unmarked Adriatic and Aegean/Black seas. Three further gulfs are shown: the Caspian to the northeast and the Arabian (i.e., Red Sea) and Persian gulfs to the south. Paradise is shown in the far east, beyond the Ocean. Four rivers run from it and cross under or through the Ocean to reach Asia and Africa. 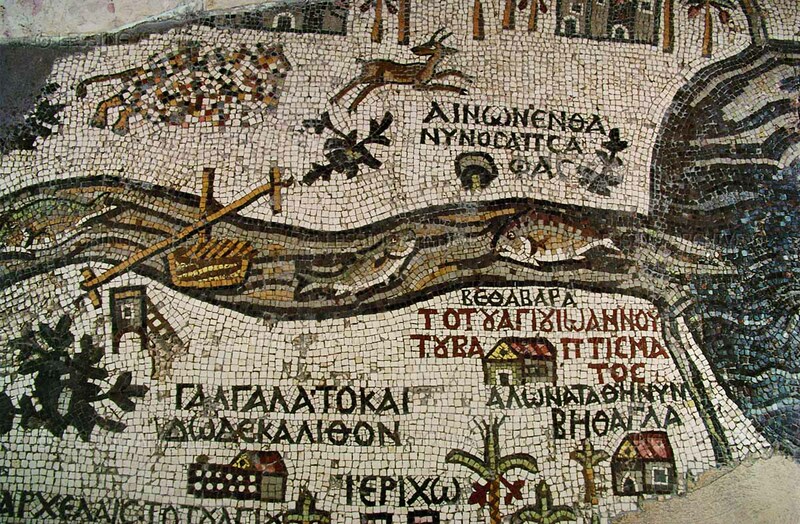 Here is a byzantine mosaic map. The city at the bottom (ΙΕΡΙΧW) is Jericho and the Sea on the right is the Dead Sea. I wasnt able to find a source of this map. 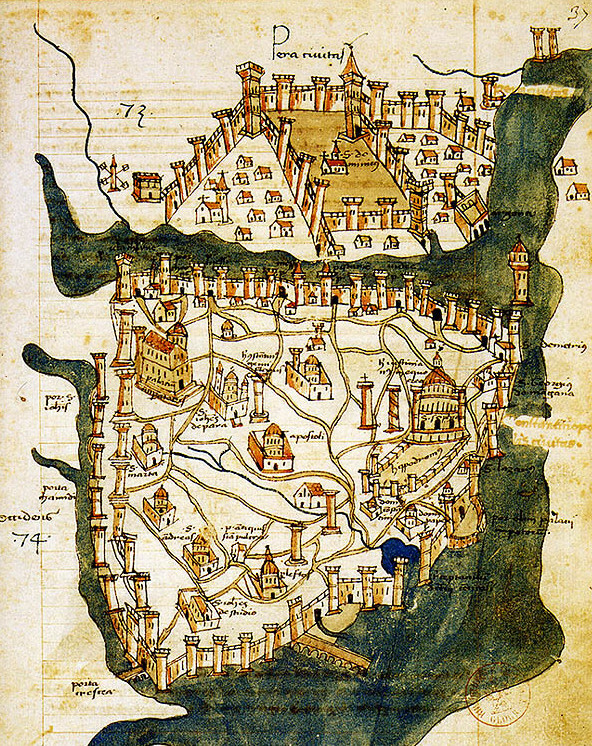 I'm sure there are better examples, but I'm particularly fond of the only pre-1453 map of Constantinople, which dates from 1422 (see below). Wikipedia has a list of old manuscript maps, which appear to date from the 7th to the 15th century, so if there are Byzantine maps to be found, they might be there. Not the answer you're looking for? Browse other questions tagged byzantine-empire maps or ask your own question.